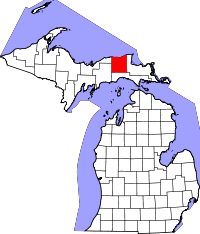 Luce County, a county with a fairly small population, also has a small genealogy research area with the County Clerk in the County Government Building on 407 W Harrie St., in Newberry, MI. While two individuals are allowed access to research in one period, the Clerk staff may prohibit access in the event that the office is busy with other matters. Under normal circumstances, the office is open every weekday except Tuesdays from 8:30AM to 10:30AM, and again from 1:00PM to 2:00PM. Birth, death, and marriage records are listed from 1887 to the present, however while death and marriage records are open to the public, access to birth records younger than 110 years is limited to verified relatives of the original certificate recipient. Once birth records date beyond 110 years old, they join the public record along with death and marriage records. Requests for records by mail are also accepted when sent with the appropriate forms and fees.